Graham McNeill takes the reader to the 31st millennium, when humanity is at the peak of its powers. 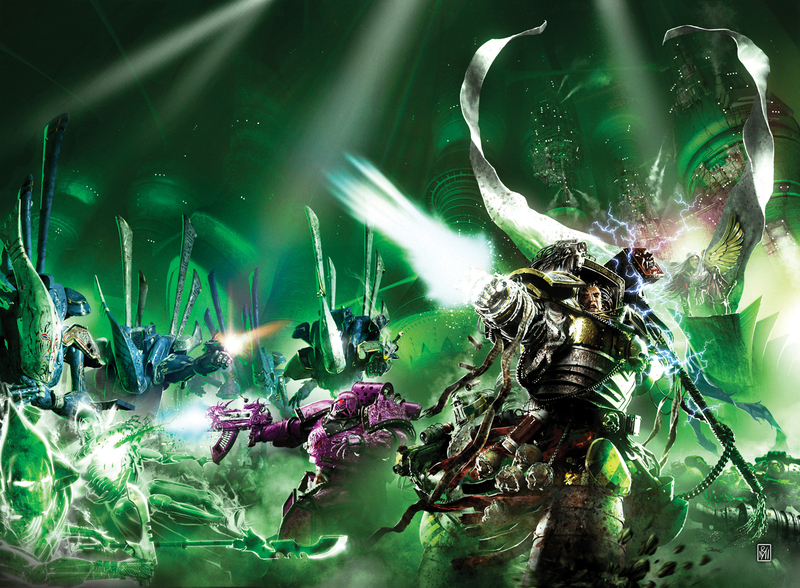 As the Great Crusade, led by Warmaster Horus, continues to conquer the galaxy, Fulgrim, the god-like Primarch of the Emperor’s Children Space Marine Legion, leads his warriors into battle against a vile alien foe. From the blood of this campaign the seeds are sown that will lead this proud legion to treachery, taking them down the darkest of paths to corruption. Leading up to the carnage of the Dropsite Massacre on Isstvan V, this is the tale of Fulgrim’s tragic fall from grace. Still hot on the Horus Heresy, Fulgrim was a novel I’d wanted to write since our first meeting on the subject in the summer of 2005. The story of the two brother Primarchs, Fulgrim and Ferrus Manus was one that screamed tragedy and one that I thought would make for a really powerful novel. I’d made my interest in this book pretty clear from the outset, and when Lindsey and I talked about what my next book would be, it was Fulgrim all the way. Right from the off, I knew that this was going to be a long book as, given where Galaxy in Flames had ended, we needed a book to take us up to the events of Isstvan V to let the other authors being let loose on the Horus Heresy a jumping off point. So we decided that, rather than try and squeeze everything into a standard 95,000-word book (though none of my books that have been contracted to that word count have ever come in at less than 105,000 or so…) we’d go for something a little larger. Thus Fulgrim was set to be a 125,000 word book, though predictably, it expanded in the telling, though not so much that we couldn’t squeeze it all in! Look at it this way, you’re getting more bang for your buck thanks to my desire to get every last detail in there for you. Anyway, to really play out the horror of what happens between Fulgrim and Ferrus I first needed to see them at their best, when the brotherhood between them was at its strongest and learn what would bring them to their final confrontation on the black sands of Isstvan V. Planning this book was a nightmare of epic proportions as it begins at the same time as Horus Rising and took place over the same span of time as all three of the novels in the opening trilogy, which meant I had to make sure my timescales matched the events where the Emperor’s Children appeared in Horus Rising, False Gods and Galaxy in Flames. This also meant that some scenes that had already appeared in other books had to appear again. Rather than just repeating those scenes, I kept the dialogue and switched the perspective so that we saw events through another character’s eyes, which makes for some interesting shifts in what you might have thought was happening before. During the writing of Fulgrim I left Games Workshop and began my career as a full-time writer, which has been a scary, exciting and new experience for me. Writing during the day was an odd thing for me, as all my previous books for the Black Library had been written in the evenings after a hard day’s work in the Games Development Team, but it’s a transition that’s been relatively smooth, though the temptation to sit around and watch daytime TV was cured by actually watching some of it, meaning I actually do work during the day, which was something I was afraid I’d fall out of the habit of doing. This novel also gave me a chance to address an issue that’s proven contentious amongst the fans of the Heresy series…the final murder of Ferrus Manus. Some people didn’t like how it had been portrayed, but what they often forget is that the facts they have are those that are told to Horus by the daemon that possesses Fulgrim…hardly the most reliable of sources, eh? This scene was a delicious one to write, I mean, how often do you get to write a scene where one Primarch kills another? I channelled everything we thought we knew about event together with my own views on the subject and what I thought made for a dramatic scene, given how Fulgrim had evolved over the course of the book. If any scene in this book was read over and over again to make sure it was right, it was this one. It’s unlikely to keep everyone happy and I’ve no doubt that some people will still think that it’s not ‘right’, but I hope I’ve managed to take what we know and write a scene that people will find memorable and, hopefully, moving.